I don't know what it is about the month of May, but it makes me think of tea parties. As a little girl, I often set up tea parties my niece (only four years younger) and I enjoyed using my very best plastic play dishes. Then my grandma gave me a child's set of Blue Willow dishes. To say I was excited would have been a gross understatement. I set up tea parties every opportunity I could. 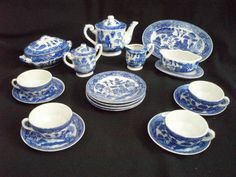 We dined on such delicacies as cheddar cheese and saltine crackers, but they tasted so much better on the pretty dishes. Everything about the idea of a tea party appealed to me - the beautiful dishes, the delectable treats, the opportunity to dress up. When I started working as a newspaper reporter, I volunteered to cover any "teas" or similar social events because I loved going to them. The year my cousins decided to host a tea party, I drove four hours one way just to attend. Scones, quiche, fresh fruit that was so flavorful, tea sandwiches and decadent desserts as well as some really tasty tea comprised the menu. The table was set beautifully. The three hostesses pulled out their mom’s china and tea sets. It was so special to use those dishes because it made it seem like a Aunt Louise was there enjoying the party right along with us even though she'd passed away several years prior to the event. We all were asked to wear a hat and that in itself was a hoot. Those who didn’t have hats were able to choose one from a vintage collection a cousin borrowed from a friend. 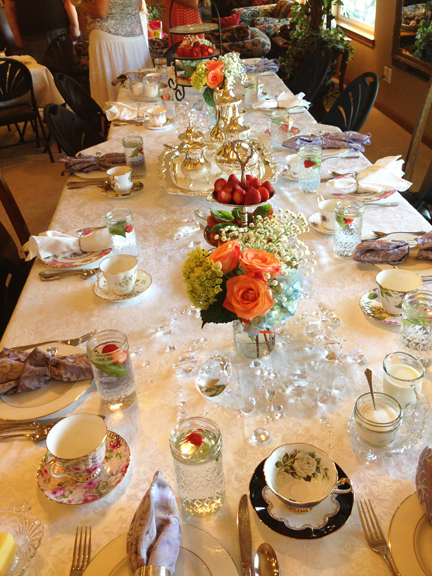 Another fun tea party came in the form of a bridal shower. We are all asked to wear a Victorian hat. Of course I was game for the idea. Guests walked in the door to find this absolutely gorgeous table. 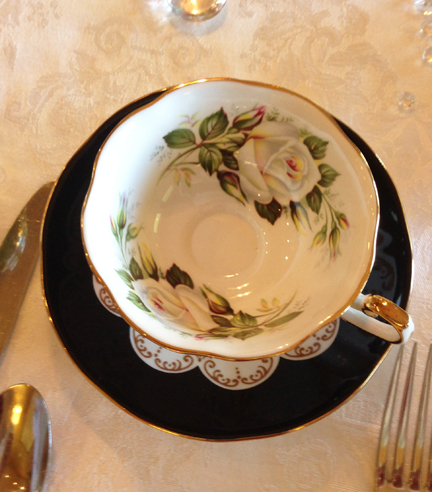 And I fell in love with this tea cup. It was so pretty. I briefly considered if the hostess would miss it if it accidentally climbed into my purse and went home with me. It stayed behind when I left, though. I think, more than anything, the idea of a tea party makes me smile because it provides a hint of the elegance of yesteryear. It also allows us, for even an hour or two, to recall those wonderful adventures and dreams we had as little girls, envisioning our futures as we poured tea and ate crackers. To celebrate the release of my latest sweet romance novel this week, I'm hosting a Tea Party on Facebook this Friday, May 13, from 10-11 a.m. (PT). I hope you'll join in the fun! What about you? Did you play tea party as a little girl? Have you ever attended or hosted one? How fun is that? I'll have to send you a photo of my grandmother's tea cups. Your table looked fabulous! They sound lovely, Janie! I collect teapots and love each and every one of them. My granddaughters always want to play tea party with me. So far it has been completely pretend. I should have them host a real tea party with food. Oh, you should! They would love it and most likely treasure the memories for a lifetime! Thank you, Violet. Appreciate you stopping by today! Lovely pictures! My oldest daughter picked a tea party theme for her birthday one year. We had a lot of fun! My sister-in-law let us borrow her beautiful tea cup sets to use at the party. Each of the children got to make themselves a hat with flowers and a bowl (sounds strange, but they were really cute). We took a picture of each child in their finery and each one got to pick and decorate a sugar cookie to go with their tea. Everyone had a great time! Looking forward to the Tea Party on Friday! What a lovely post! Congratulations on your new release! 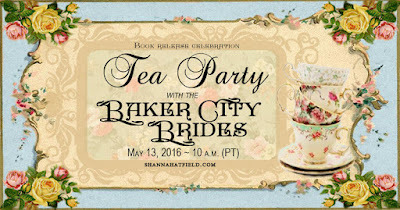 Oh my goodness, this Tea Party by Shanna Hatfield was fabulous. I loved the photos and that table setting is amazing. I can use this setting even for my DIY wedding that will be organized in next month at the local NYC wedding venues.